Here’s a look at hotels guaranteed to make your high-tech dreams a reality. NEW YORK (MainStreet) — Free, universal WiFi has become the new water in the highly competitive hotel industry - viewed as a basic, must-have among travelers who have come to expect an increasingly sophisticated array of technology wherever they go. Yet WiFi is just the tip of the iceberg and perhaps the most simplistic offering in the technology race among hotels, which now includes robots to gather guest luggage, biometric PayTouch systems, iPads to control everything from room lighting to music, self-service kiosks for check-in and virtual reality experiences within rooms. Take Marriott Hotels, for instance. The hotel company recently issued a press release announcing what it's calling the first ever in-room virtual reality travel experience. VRoom service, as the hotel has labeled it, allows guests engage in virtual reality travels in their room using a Samsung Gear VR headset and headphones. To date, that includes going on journeys via VR Postcards programs developed by Marriott that are immersive travel stories following a real traveler on a journey to a specific destination -- such as the Andes in Chile, an ice cream shop in Rwanda or the bustling streets of Beijing. Guests using the in-room headset experience the journey in 360 3D. This is just one of the more intriguing examples when it comes to the innovative ways hotels are using technology these days. Starwood Hotels and Resorts recently announced the launch of SPG Keyless, a program it says is the hospitality industry's first truly mobile and keyless entry system -- allowing participants to access their room using a Smartphone rather than an actual key. Since launching at ten hotels in November 2014, 190,000 members have registered their phones for SPG Keyless. The offering is now available at more than 140 of the company's hotels around the world, including Aloft, Element and W Hotels. "Travel is by nature mobile and with everyone carrying a cell phone nowadays, it just made sense to design and build a truly mobile, keyless solution," says Alyssa Waxenberg, Starwood's vice president for digital. Not to be outdone by the giant chains, are smaller innovators such as Eccleston Square Hotel in London. The hotel has outstanding integration of technology within the guest room such as bathrooms with smart glass walls, bathroom mirrors with hidden televisions and an in-room iPad that can be used as a personal concierge. 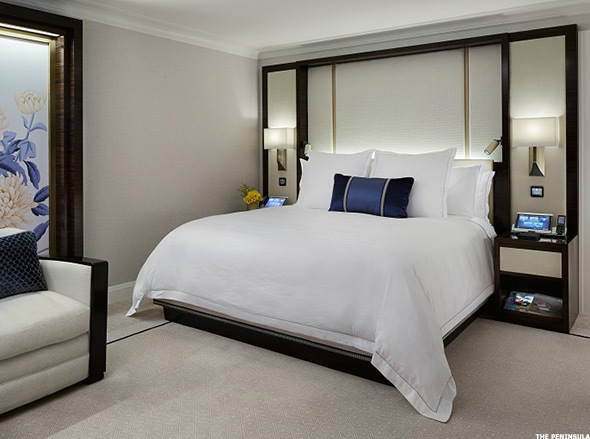 Meanwhile guest rooms at The Peninsula Hotel in Chicago include touch screen tablets that communicate in 11 languages and control every aspect of the room - from lighting to room temperature. Other information available on the iPad includes restaurant menus, hotel services, city information and attractions. Another fun feature here are the LED touch-screen wall panels that offer weather details, language and privacy options. "Consumers have so much of this technology already at their fingertips at home, that when they get to a property and they don't have it, they feel left out and that can negatively reflect on a hotel brand," says Accenture's Managing Director of Digital for Travel, Kevin Carl. Two mega trends are emerging right now within the hospitality industry, according to the management consulting firm. The first is that consumer technology offerings are setting the pace for the hospitality industry. "What's available in the market and that consumers and travelers have in their home, is increasingly setting the expectation for what they are going to have in their home away from home," explains Carl. "Take, for example, home automation systems that allow you to control, lighting, music, security, all of those things at the touch of a button. Travelers have that at home, and want the same thing when they travel." The second trend identified by Accenture is what Carl calls the "etherealizing" or integration of technology at hotels. "This will involve a variety of services being available through a variety of physical touch points or voice touch points at the hotel," says Carl. "These are services on demand, that can be delivered in a variety of ways." Carl describes a future that includes an ecosystem of all sorts of high-tech services and offerings, one that involves hotels tapping into the individual traveler's personal technology in order to provided increasingly curated experiences at the hotel. "Hoteliers want to be viewed as relevant and innovative, especially because that's something Millenials place great value on," says Carl. "It's a very expensive proposition though," he continues. "So what hoteliers are doing right now is a lot of experimenting, launching innovation hotels, and innovation labs. They are experimenting and exploring, trying things in test markets because going big with some of these ideas is very expensive." If this is all starting to feel just a little bit like "The Jetsons" perhaps, that's not all that far fetched. Nowhere is such a comparison truer then at YOTEL, in New York City, where the concierge robot that collects guest luggage is affectionately called the "Yobot." "It's a very cool thing and very different," YOTEL's Jo Berrington says of Yobot, which stores bags for guests and dispenses a barcode that can be used later to retrieve the luggage, allowing travelers to explore a destination before or after check-in without worrying about their bags. "It's fascinating and mesmerizing to watch. We have people walking past outside of the building who will stop and watch it working. It certainly makes people smile. If we have kids staying, they love it." Since its inception, the YOTEL brand has been a forward-thinking, technology-driven company. Among the company's additional offerings is the SmartBed, which converts at the touch of a button from a flatbed to a sofa to create extra space and a new mobile app that allows guests to digitally interact with the hotel before, during and after their stay. Once signed into the YOTEL app, guests can view reservation details, check in and out, request a late checkout and view daily charges and payments. If guests are staying at the hotel as part of a group, the app allows for chatting with other group members to arrange meetings, drinks, social events and more. If exploring the city is on the agenda, the app can provide a curated list of suggested places to visit and tips for getting around. "A lot of times brands introduce technology for technology's sake and it's not that useful or practical with the guest in mind," says Berrington. "We wanted a way to incorporate really forward thinking technology, but at same time make it very practical." Opened last summer inside Denver's historic Union Station, each guest room features an iPad mini loaded with the hotel's app, which allows for ordering room service, setting up a spa appointment, requesting your car from valet and more. Televisions in the guest rooms here are Samsung 46-inch Smart HD loaded with Netflix, Hulu, and Pandora. Oh, and one other alluring detail for car aficionados - the hotel's complimentary car is a Tesla. Hotel business centers, with their (yawn) fax machines and printers, are almost becoming quaint or outdated in today's tech-savvy world. Modern travelers need even more high-tech options. Eventi, A Kimpton Hotel, now has a "Business Bar" complete with nearly every gadget you can think of. Forgot your headphones? No problem. Need a charger? The Business Bar has those too. Want to test out some of the latest gadgets? Feel free to indulge here. Among the tech amenities that can be checked out are iPads, iPad minis, MacBook Pros, Kindle or Nook reading tablets and the latest digital cameras from GoPro. New York City just may be one of the leading locations when it comes to hotel technology. 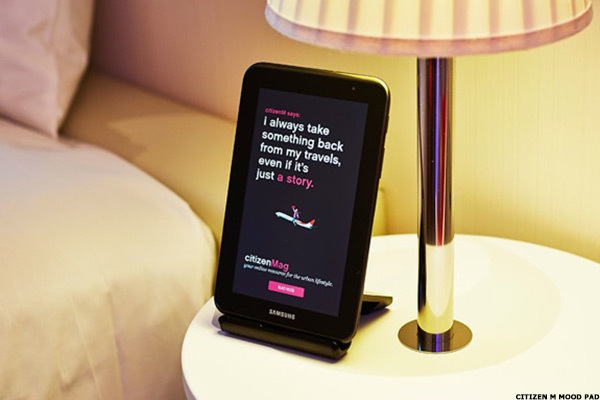 Citizen M provides yet another example. This 230-room property's innovative amenities include self check-in via touch screen terminals in the lobby, completely customizable guest rooms via touch screen MoodPads (guests can control the room temperature, colored lighting, television, blinds, wake up alarm, and music all via the pad.) The hotel also offers communal workspaces and Apple iMac stations. Hanging on the walls, meanwhile, is the latest in digital artwork technology. Found even in the guest rooms, the digital art installations allow guests to select from pieces by contemporary artists such as Mark Titchner and Tracey Emin.